The ubication was good, 20 min walking to the centre. They offer breakfast every morning, and it is good: toasts, jam, butter, milk, cereal, coffe. The beds are comfortable. And the lining room area are just good. Nothing!! If you love yourself don’t go this hostel. Free breakfast, nice staff and very cheap price. Location of the hostel is also very good. You can leave your luggage inside a locker and go sightseeing. Location is also not far from the city centre. The kitchen was really good, the Wawel Castle it's 3-4 minutes away by walk, there are 2 express shops downstairs, the tram station was located near the entrence in the hostel, the bathroom was fine. I could pay with euros and they give me back zloty. Location was great. They offered very basic breakfast which I did not have as Krakow is so cheap you can easily find a nice healthy breakfast in town. Good and hospitable hosts. The hostel has a 24*7 working reception. The bathrooms were very clean. The hostel provides free breakfast too and above all the hostel is so affordable. Breakfast is a joke. The kitchen is always a mess after cleaning staff leave. People there dont clean up after themselves. Signs in Polish and English but they are ignore by Ukranians staying there as the dont speak English or Polish. The bathroom are always a mess. Made several complains but nothing was done to fix it. After a month of living there, i am happy to be free. If the staff onlyb3npeoplenwerebfriendly and helpful. As a Polish person. I was very u happy. Only 2 of 4 burners on the stove work. It was not a good hostel and should be closed. One of our bestsellers in Kraków! 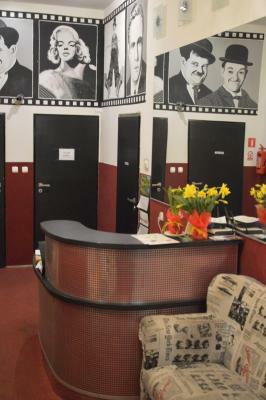 Located only a 5-minute walk from the Gothic Wawel Castle, Hostel B Movie features film-inspired design. Guests are welcome to use Wi-Fi in all areas free of charge. All rooms at B Movie are warmly decorated and simply furnished. Each comes with a movie-themed mural painting. Dormitory rooms feature access to shared bathroom facilities with a shower whereas the private rooms are en suite. Guests can relax watching satellite TV in the common living room. They can also store their luggage free of charge and make use of the free safety deposit box available at the 24-hour front desk. Continental breakfast is served daily at Hostel B Movie. There is also a well-equipped shared kitchen fitted with a stove, a toaster and essential kitchenware. Błonia Park is situated 1.9 miles from the hostel. The distance to Kraków Main Railway Station is 1.2 miles. Hostel B Movie has been welcoming Booking.com guests since 21 Jun 2013. When would you like to stay at Hostel B Movie? A bed in a simple and warmly decorated dormitory featuring movie-inspired décor and access to a shared bathroom. This simply furnished room features movie-inspired décor and offers a private bathroom with a shower. Property surroundings – This neighbourhood is a great choice for travellers interested in restaurants, food and history – Check location Great location - show map Guests loved walking around the neighbourhood! House rules Hostel B Movie takes special requests - add in the next step! Please note that persons under 18 have to be accompanied by an adult. Guests are required to show a photo identification upon check-in. In case of reservations for over 7 people a prepayment with a bank transfer is required. The property will contact you after you book to provide instructions. I can't find no dislikes.. Overall I was very happy with the Hostel, great wifi, plenty off washrooms and free coffee and tea all day.. The bathrooms could be cleaner. The price. Free breakfast. Location. someone eat and chat in the room. The bathrooms were a bit dirty. The entrance of the hostel smells really bad, they should clean the stairs. Toilets and bathrooms were really bad and dirty. Rooms also really bad. When you enter the hostel, a kind of bad smell hit your face.Everything was so bad and I just want to forget this experience. The place wasn't perfectly clean and also it was quite old but that is to be expected. I also didn't get along with all of the "roommates" but that is not the hostel's fault. But you do have to share space with others. The worst hostel I have ever been to. Loud, not very clean and a really bad smelling man came in the middle of the night into the room. He smelled so bad I had to sleep on the couch in the common area where it was really loud so I didn't get much sleep. Unless you are here to party avoid at all costs. Rooms, bathrooms and kitchen all together weren't really clean. The location of the hostel is great. I can say that it is the greatest example of a truly honest hostel experience that I have enjoyed. Yes, O.K. I can imagine well that some people could complain that it is not as sterile and generic an accommodation experience .. figuratively thinking. We get a little bit more than we pay for at hostel B movie.. It rates highly and does put Kraków higher up on the visit list !! !